Alzheimer’s disease, a progressive disease of the brain, is the most common form of dementia. Some underlying causes of Alzheimer’s are genetics, age-related changes, and health/environmental factors. The most common framework is a a seven-stage system, developed by Dr. Barry Reisberg of New York University. The 7 stages are: No Impairment, Mild Decline, Continued Mild Decline, Moderate Decline, Moderately Severe Decline, Severe Decline and Very Severe Decline. 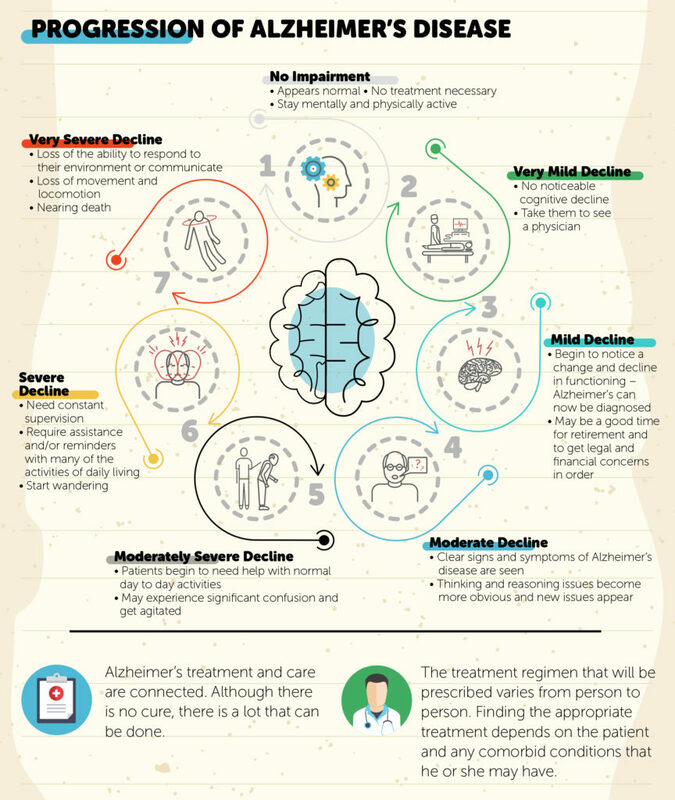 The symptoms in each stage can vary from person to person and stages can also overlap considerably which makes it difficult to place a person with Alzheimer’s in a specific stage. 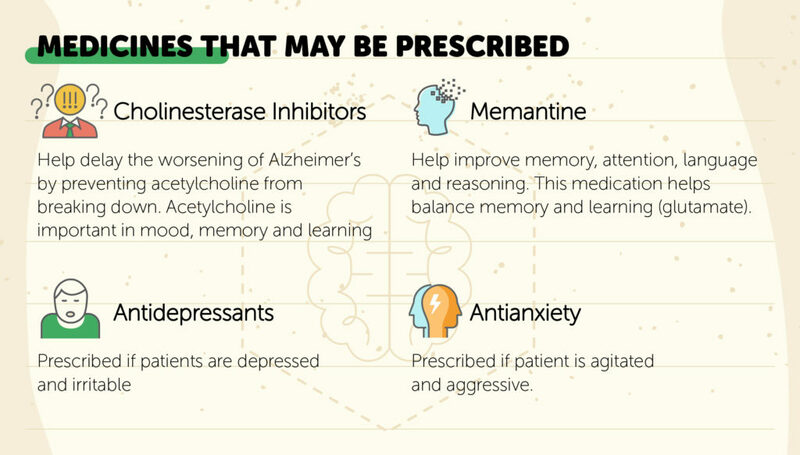 Although there is no cure for Alzheimer’s disease, the right mix of medications and compassionate caring can alleviate some of the symptoms and improve quality of life. Alzheimer’s is a progressive disease of the brain that slowly causes impairment in memory and cognitive function. Alzheimer’s Disease is the most common form of dementia, and it is a disease that drastically changes the lives of individuals who are diagnosed and their families. 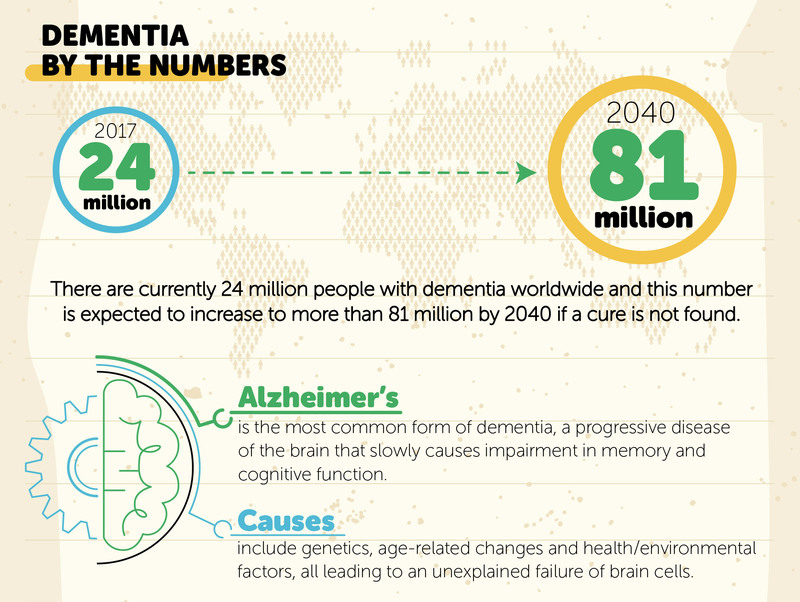 There are currently more than 24 million people with dementia worldwide, and this number is expected to increase to more than 81 million by 2040 -if, that is, a cure is not found. Dementia is the term applied to a group of symptoms that negatively impact memory. According to the National Institute on Aging, the causes of Alzheimer’s are not completely understood. There has been some evidence to support genetics, age-related changes, and health/environmental factors as essential underlying causes. What scientists do know is that Alzheimer’s disease involves an unexplained failure of brain cells. Research is ongoing for why brain cells fail, a phenomenon that is not clearly understood. According to the Alzheimer’s Research Center, Alzheimer’s genes have been identified in both these categories. Risk genes increase the likelihood of developing a disease, but they do not guarantee that it will happen. Deterministic genes directly cause a disease and guarantee that anyone who inherits these genes will develop the disease. The most common risk gene for developing Alzheimer’s is apoE4. Deterministic genes include genes such as APP, PS1, and PS2. Alzheimer’s is not a normal part of aging. One of the greatest risk factors for developing the disease, however, is advanced age. Research has shown that the risk of getting Alzheimer’s doubles every five years after age 65, and the risk increases by 50 percent after age 85. There is research to support the relationship between cognitive decline and other conditions such as heart disease, high blood pressure, strokes and obesity. Reducing the risk factors for these chronic conditions may also reduce the risk for Alzheimer’s. As with any dementia, each individual’s experience with Alzheimer’s is unique. With that in mind, there are some similarities that can be identified in each stage of the disease. The precise number of stages could be debated, with some experts preferring to keep it simple, presenting a three-stage breakdown (early, moderate and end). This article describes the most common system developed by Dr. Barry Reisberg of New York University who developed a seven-stage system as a framework to understand the progression of Alzheimer’s disease. The rate of progression of the disease varies. Once a person is diagnosed with Alzheimer’s disease, they can live as long as 20 years depending on other factors. Because stages can overlap considerably, it can also be difficult to place an individual with Alzheimer’s disease in a specific stage at any given time. However, it still provides a useful framework to understand where your loved one falls in their progression of the disease and the best course of treatment/care. During this stage, there are no detectable memory problems or other symptoms of dementia. This stage could also be referred to as the pre-clinical phase. It has been found that changes in the brain begin years before any actual signs of the disease develop. Forgetfulness can be brought on for a number of reasons including normal aging, head injuries, vitamin deficiencies, medication side-effects, depression, meningitis, syphilis, drug-interactions, dehydration, brain tumors and the effects of alcohol and/or drug abuse. Some of the causes are reversible that is why it is important for individuals to see their doctor to rule out other causes. In normal aging, you may not be able to find your keys, and you may have “senior moments” where you can’t remember a name or a word and can’t find a recipe. You may also forget to make a record of a check you issue. In early Alzheimer’s, you may commonly misplace items, e.g. you may place your keys in the refrigerator or in the oven; you might start having difficulty recalling everyday words and find yourself substituting other words in their place. You may have difficulty following a recipe you’ve cooked many times before or planning ahead. If you have Alzheimer’s, you may also experience some changes in your mood and personality. As previously stated, the first stage is the pre-clinical stage, and there is often no necessary treatment. The first stage does not involve a decline in a person’s mental ability. The plaques and tangles associated with the disease can however be present in the brain several years before there is any noticeable effect on individuals or their abilities. It is important to stay mentally and physically active at every stage, not just with dementia, but generally in life. Provide your loved one with activity books that help memory and word recall. Encourage physical activity such yoga, walking, and stretching. Stay active with social groups and go out to lunch and dinner with friends and family. Encourage them to continue to do the things they previously enjoyed. And, periodically have your family member checked by their primary care physician. James was a 55 year old engineer. He would occasionally forget the name of a colleague. This concerned James, since he was known for his good memory, and because he had a family history of Alzheimer’s disease. Both of James’ parents were diagnosed with the disease in their sixties and James and his siblings took care of them until they were admitted to a long term care facility. James went to his primary care physician to find a cause for his forgetfulness. After going through a battery of tests at his doctor’s office, James found out that he was diabetic and made the necessary changes to his diet and started taking medication. His doctor encouraged him to stay active and to take his medications and to return for a follow-up appointment. In this case, James did not have Alzheimer’s disease. He did have concerns because of his age and family history. He found out that his forgetfulness could be attributed to diabetes. Continuing to monitor himself and remain aware of his health will help both James and his family. At this stage, the individual may still do well on memory tests and people close to the individual may not notice any significant changes. The individual is still able to function in his or her day-to-day life. Also at this stage, memory loss can’t be easily differentiated from normal age-related forgetfulness. The individual is still able to work and live independently. He or she will likely be the first to notice changes that no one else can identify, including the physician. The family can help the person by taking them to their primary care provider to make sure that there are no reversible reasons for the changes. Seeing your physician is important at this stage to make sure that your loved one is not misdiagnosed. There are conditions that can mimic dementia that are reversible, such as urinary tract infections. Treatment will depend on the cause of the symptoms, and other conditions that the person may have, such as hypertension, diabetes, stroke, and heart disease to name a few. Work to ensure that your loved one maintains a sense of autonomy and dignity. Ella is a 60 year-old widow who lives with her son and his wife. Ella loves to do puzzles with her 11 year-old granddaughter. Recently, Ella found it unusually difficult to complete this activity with her granddaughter. She spoke to her son about her loss of concentration, and they made an appointment with her primary physician for further evaluation. People in this stage will begin to notice of changes in their loved one. The individual will have difficulty on cognitive tests, and doctors will be able to detect a decline in functioning. Performance in demanding situations may weaken, and the individual may be unable to learn new skills. This is the stage when Alzheimer’s disease is diagnosed. The family can help their loved one by making sure bills are paid, and making sure he/she gets to appointments on time. In order to help the person reduce stress, this may be a good time for them to retire if they haven’t already and to get their legal and financial matters in order. Adjust home surroundings to minimize confusion. Keep their choices simple, regularly assess their ability to drive safely, reduce clutter, and place lists of contact numbers at convenient spots so that they can call if and when they need help. Amy remembers when her mother began showing signs of Alzheimer’s disease. It started shortly after Amy’s father died. Her mother began bouncing checks. This was odd since her mother was always the one who took care of the bills and was always well organized. Amy thought the changes in her mother were due to the recent passing of her father. Usually very put together, her mother’s hygiene had become poor, she did not want to eat and she seemed to get easily confused. After convincing her mother to go to the doctor to get checked for depression, her worst fears were realized, her mother had Alzheimer’s. During this stage, signs and symptoms of Alzheimer’s disease become obvious. Thinking and reasoning issues become clearer, and new issues appear. Individuals in this stage often withdraw from participation in activities they previously enjoyed, like conversing with family. The family can help their loved one by making sure that he/she is safe, assisting with daily chores, making sure that he/she is not driving, and ensuring that the person is not being taken advantage of financially. Mrs. Smith always enjoyed cooking for her family. Her husband noticed that she would forget food was cooking and had even left the gas on in the kitchen at one point. Mr. Smith now has to watch his wife more carefully and make sure that they are both safe, and check that the oven and burners are turned off throughout the day. During this stage, individuals begin to need help with normal day to day activities. Individuals in this stage are able to bathe and go to the bathroom and are typically still able to recognize family members. They are also still able to recall their history, especially details about their youth. People in stage five may experience significant confusion. They often have an inability to recall simple details like their own phone number. They have difficulty dressing appropriately and require assistance in choosing the right clothes for the right season. They may have difficulty with remembering the time of day and identifying which season they are in. The person can also easily get lost since they may not remember their address or how to get home. The family can help by laying out appropriate clothing and encouraging the person to be independent by allowing them to dress themselves. Caregivers should also respond to the person’s questions, even when he or she repeats them (this can be reassuring). Listen to your loved one when he or she wants to tell a story, even if he or she might not remember all of the facts. Engaging the family member in conversation can help them to use their imagination and feel socially supported. It is important to be there for your loved one and continually reassure them. Mr. Jones has Alzheimer’s and experiences some difficulty choosing weather-appropriate clothes. He frequently chooses winter sweaters and winter coats to wear in the summer. His wife has begun to help him by laying out the appropriate clothing for him and reminding him of the time of year. Individuals in the sixth stage of Alzheimer’s disease need constant supervision, and if family members are not able to provide care, they will require professional caregivers. Individuals in this stage will require assistance and/or reminders with many of the activities of daily living (bathing, toileting, and dressing). They may also experience incontinence of bowel and bladder. At this stage, the person may need help with going to the bathroom, for they may simply forget how to go to the bathroom or where the room is. They may have delusions like thinking they are late for their job when they no longer work, which may cause wandering. Wandering can be a serious concern for those caring for individuals with late stage Alzheimer’s. You may be able to help by giving them responsibilities in the home, like setting the table or folding the laundry. It is important to remember that your loved one may be easily startled, so approach him/her gently and from the front so that they do not get scared. Your tone of voice is all-important as well. What you say is as important as how you say it. Think of yourself being in a foreign country and not speaking the language, how would you feel if people were yelling at you and frowning? In the same situation, if people are smiling and speaking in calm tones, you would feel comfortable and safe. Tiffany and her sisters have been taking care of their mother in her home. Their mother has Alzheimer’s disease, and the sisters live nearby and take turns staying with her and providing her with daily assistance. Recently, it became necessary to enroll their mother in an adult day care. Their mother always valued education, and they told her that the adult day care was a school. This allowed them to keep their mother safe and socially engaged and stimulated. This is the final stage of Alzheimer’s disease, in which individuals are nearing the end. They eventually lose their ability to respond to environmental cues or communicate with others, and while they may utter words or phrases, they won’t have much meaning; they require assistance with all activities of daily living. In the final stage of the illness, individuals lose their ability to swallow. Many of the basic functions of daily living are lost in this final stage. The person is no longer able to walk, eat, or sit up. Stay involved by feeding your loved one with soft, easy to swallow food, helping them use a spoon, and making sure that they are drinking plenty of liquids, as many people in this stage can no longer tell when they are thirsty. Maintain your loved one’s mobility by assisting them with walking using whatever equipment necessary (walker, gait belt or wheel chair). The progression of this stage will depend on several factors, including the overall health of the person and the quality of care that they are receiving. Mr. Grant is in the final stage of Alzheimer’s disease and can no longer feed himself. His son comes to the nursing home every day at dinner time and feeds him. It is important that Mr. Grant is sitting up in the wheel chair properly to prevent aspiration. If your loved one has moderate to severe Alzheimer’s, the physician may prescribe Memantine. Memantine could help improve memory, language, and reasoning. Glutamate also helps balance memory and learning. It has been shown to curb delusions, hallucinations, agitations, aggression and irritability; it can also help with disorientation and help make performing daily activities easier. While these medications can help ease some symptoms of the disease for a period of time, they are not equally effective for everyone, so consult with your doctor. Creating a calm and quiet place (cutting out background noise from TV or radio, and clearing away clutter, and making tasks simple). Checking for physical reasons for the agitation: hunger, thirst, needing to go to the bathroom. They may not be able to let you know what is wrong. Exercising can ease anxiety and stress (help find an activity that they enjoy). Keeping your emotions in check (avoiding criticizing or arguing). The best way to help your loved one is to try and pace your energies and emotions and get as much respite as you can. To take care of others, it is vital that you take care of yourself too. If you can afford it, hire a professional caregiver to come and give you some relief, even if it is only for a few hours a day, two or three days a week. It also serves you to work in close coordination with the medical team, for they can help improve quality of life for everyone involved in your loved one’s care. 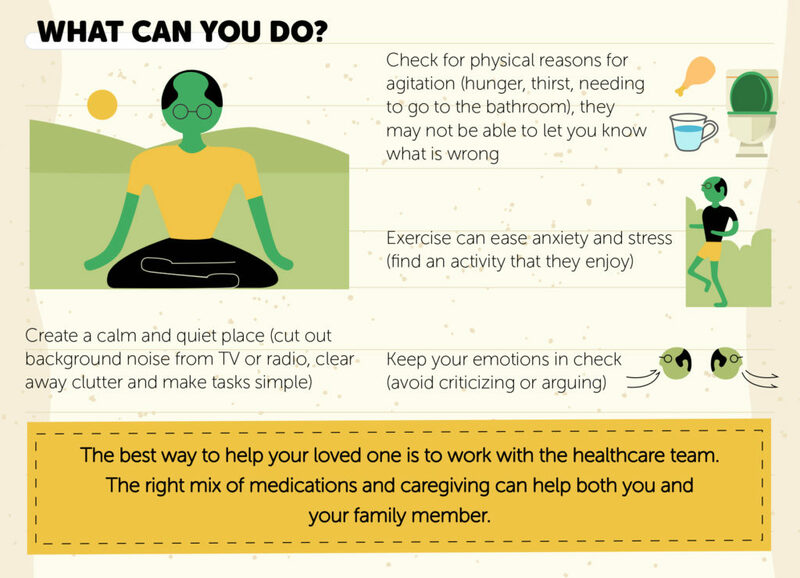 In the end, the right mix of medications, compassionate and informed care, and social interactions and meaningful activities can help support your loved one through this difficult disease.